The Austronesian peoples or more accurately Austronesian-speaking peoples, are a group of various peoples in Southeast Asia, Oceania and East Africa that speak Austronesian languages. The nations and territories predominantly populated by Austronesian-speaking peoples are known collectively as Austronesia. Another term used by Wilhelm G. Solheim II to refer to Austronesian-speakers with a maritime-oriented culture is Nusantao ("south island people"), as part of his Nusantao Maritime Trading and Communication Network hypothesis. Austronesian-speakers today include the Taiwanese aborigines and most of indigenous inhabitants of Maritime Southeast Asia, Madagascar, Micronesia and Polynesia, as well as the Cham of Southeast Asia. The linguistic connections between Madagascar, Polynesia, and Southeast Asia were recognized early in the Colonial Era by European authors, particularly the remarkable similarities between Malagasy, Malay, and Polynesian numerals. The first formal publications on these relationships was in 1708 by the Dutch Orientalist Adriaan Reland, who recognized a "common language" from Madagascar to western Polynesia; although the Dutch explorer Cornelis de Houtman also realized the linguistic links between Madagascar and the Malay Archipelago prior to Reland in 1603. The Spanish philologist Lorenzo Hervás y Panduro later devoted a large part of his Idea dell' Universo (1778-1787) to the establishment of a language family linking the Malaysian Peninsula, the Maldives, Madagascar, the Sunda Islands, Moluccas, the Philippines, and the Pacific Islands eastward to Easter Island. Multiple other authors corroborated this classification, and the language family came to be known as "Malayo-Polynesian," first coined by the German linguist Franz Bopp in 1841 (German: malayisch-polynesisch). The term "Malayo-Polynesian" was also first used in English by the British ethnologist James Cowles Prichard in 1842 to refer to a historical racial category roughly equivalent to the Austronesian peoples today, and not to the language family. However, the Malayo-Polynesian language family initially excluded Melanesia and Micronesia, due to what they perceived were marked physical differences between the inhabitants of these regions from the Malayo-Polynesian speakers. However, there was growing evidence of their linguistic relationship to Malayo-Polynesian languages, notably from studies on the Melanesian languages by Georg von der Gabelentz, Robert Henry Codrington and Sidney Herbert Ray. 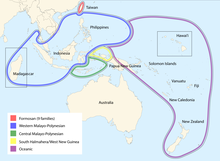 Codrington coined and used the term "Ocean" language family rather than "Malayo-Polynesian" in 1891, in opposition to the exclusion of Melanesian and Micronesian languages. This was adopted by Ray who defined the "Oceanic" language family as encompassing the languages of Southeast Asia and Madagascar, Micronesia, Melanesia, and Polynesia. In 1899, the Austrian linguist and ethnologist Wilhelm Schmidt coined the term "Austronesian" (German: austronesisch, from Latin auster, "south wind"; and Greek νῆσος, "island") to refer to the language family. Schmidt had the same motivations as Cordington. He proposed the term as a replacement to "Malayo-Polynesian", because he also opposed the implied exclusion of the languages of Melanesia and Micronesia in the latter name. It became the accepted name for the language family, with Oceanic and Malayo-Polynesian languages being retained as names for subgroups. The term "Austronesian", or more accurately "Austronesian-speaking peoples", came to refer the people who speak the languages of the Austronesian language family. Some authors, however, object to the use of the term to refer to people, as they question whether there really is any biological or cultural shared ancestry between all Austronesian-speaking groups. This is especially true for authors who reject the prevailing "Out of Taiwan" hypothesis and instead offer scenarios where the Austronesian languages spread among preexisting static populations through borrowing or convergence, with little or no population movements. Despite these objections, the general consensus is that the archeological, cultural, genetic, and especially linguistic evidence all separately indicate varying degrees of shared ancestry among Austronesian-speaking peoples that justifies their treatment as a "phylogenetic unit." This has led to the use of the term "Austronesian" in academic literature to refer not only to the Austronesian languages, but also the Austronesian-speaking peoples, their societies, and the geographic area of Austronesia. Serious research into the Austronesian languages and its speakers has been ongoing since the 19th century. Modern scholarship on Austronesian dispersion models is generally credited to two influential papers in the late 20th century: The Colonisation of the Pacific: A Genetic Trail (Hill & Serjeantson, eds., 1989), and The Austronesian Dispersal and the Oigin of Languages (Bellwood, 1991). The topic is particularly interesting to scientists for the remarkably unique characteristics of the Austronesian speakers: their extent, diversity, and rapid dispersal. Regardless certain disagreements still exist among researchers with regards to chronology, origin, dispersal, adaptations to the island environments, interactions with preexisting populations in areas they settled, and cultural developments over time. The mainstream accepted hypothesis is the "Out of Taiwan" model first proposed by Peter Bellwood. But there are multiple rival models that create a sort of "pseudo-competition" among their supporters due to narrow focus on data from limited geographic areas or disciplines. The most notable of which is the "Out of Island Southeast Asia" model. As a generalization, authors that are based in Indonesia and Malaysia tend to favor the "Out of ISEA" model, while authors based in Taiwan and the Pacific Islands tend to favor the "Out of Taiwan" model. However, other authors have also proposed more complex combined models that create more or less coherent comprehensive hypotheses with only a few contentious areas. An example of this is the "Synthetic Total Evidence Model" (STEM) by Chambers & Edinur (2015). Prior to the 16th century Colonial Era, the Austronesian language family was the most widespread language family in the world, spanning half the planet from Easter Island in the eastern Pacific Ocean to Madagascar in the western Indian Ocean. 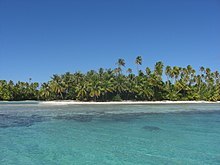 Coconuts in Rangiroa island in the Tuamotus, French Polynesia, a typical island landscape in Austronesia. Coconuts are native to tropical Asia, and were spread as canoe plants to the Pacific Islands and Madagascar by Austronesians. It is spoken today by about 386 million people (4.9% of the global population), making it the fifth-largest language family by number of speakers. Major Austronesian languages with the highest number of speakers are Malay (Indonesian and Malaysian), Javanese, and Filipino (Tagalog). The family contains 1,257 languages, which is the second most of any language family. The geographic region that encompasses native Austronesian-speaking populations is sometimes referred to as Austronesia. Other geographic names for various subregions include Greater Sunda Islands, Lesser Sunda Islands, Island Melanesia, Island Southeast Asia (ISEA), Malay Archipelago, Maritime Southeast Asia (MSEA), Melanesia, Micronesia, Near Oceania, Oceania, Pacific Islands, Remote Oceania, Polynesia, and Wallacea. In Indonesia and Malaysia, the nationalistic term Nusantara is also popularly used for their islands. Historically, Austronesians uniquely live in an "island world". Austronesian regions are almost exclusively islands in the Pacific and Indian oceans, usually volcanic in origin. The vast majority lie within ten degrees of the equator, with predominantly tropical or subtropical climates with considerable seasonal rainfall. They had limited penetration into the interiors of large islands or mainlands. They include Taiwanese aborigines, the majority of ethnic groups in Brunei, East Timor, Indonesia, Madagascar, Malaysia, Micronesia, the Philippines, and Polynesia. As well as the Malays of Singapore; the Polynesians of New Zealand, Hawaii, and Chile; the Torres Strait Islanders of Australia; the non-Papuan peoples of Melanesia and coastal New Guinea; the Shibushi-speakers of Comoros, and the Malagasy and Shibushi-speakers of Réunion. They are also found in the regions of Southern Thailand, the Cham areas in Vietnam and Cambodia, and parts of Myanmar. Additionally, modern-era migration brought Austronesian-speaking people to the United States, Canada, Australia, the United Kingdom, mainland Europe, Cocos (Keeling) Islands, South Africa, Sri Lanka, Suriname, Hainan, Hong Kong, Macau, and West Asian countries. Ethnic Maldivians also possess a genetic connection to the Austronesian-speaking groups of maritime Southeast Asia via gene flow from the Malay Archipelago. Some authors also propose further settlements and contacts in the past in areas that are not inhabited by Austronesian speakers today. These range from likely hypotheses to very controversial claims with minimal evidence. In 2009, Roger Blench compiled an expanded map of Austronesia that encompass these claims based on various evidence like historical accounts, loanwords, introduced plants and animals, genetics, archeological sites, and material culture. They include areas like the Pacific coast of the Americas, Japan, the Yaeyama Islands, the Australian coast, Sri Lanka and coastal South Asia, the Persian Gulf, some of the Indian Ocean islands, East Africa, South Africa, and West Africa. The broad consensus on Austronesian origins is the "two-layer model" where an original Paleolithic indigenous population in Island Southeast Asia were assimilated to varying degrees by incoming migrations of Neolithic Austronesian-speaking peoples from Taiwan and southern China from around 4,000 BP. Austronesians also mixed with other preexisting populations as well as later migrant populations among the islands they settled, resulting in further genetic input. The most notable are the Austroasiatic-speaking peoples in western Island Southeast Asia (peninsular Malaysia, Sumatra, and Java); the Bantu peoples in Madagascar and the Comoros; as well as Indian, Arab, and Han Chinese traders and migrants in the more recent centuries. 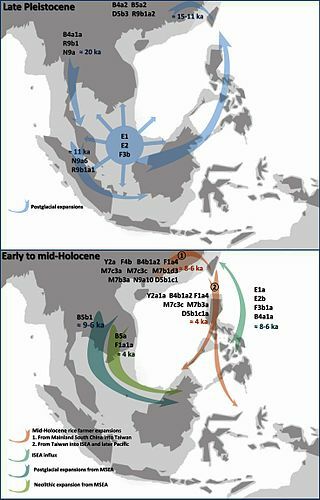 Island Southeast Asia was settled by modern humans in the Paleolithic following coastal migration routes, presumably starting before 70,000 BP, long before the development of Austronesian cultures. These populations are typified by having dark skin, curly hair, and short statures, leading Europeans to believe they were related to African Pygmies in the scientific racism of the 19th century. However, despite these physical differences, genetic studies have shown that they are more closely related to other Eurasian populations than to Africans. Humans reached the islands in Wallacea as well as the Sahul landmass (Australia and New Guinea) by around 53,000 BP (some give even older dates up to 65,000 BP). By 45,400 years ago, humans had reached the Bismarck Archipelago in Near Oceania. They were once also present in mainland China and Taiwan, but their populations are now extinct or assimilated. The oldest confirmed human fossils in the Philippines is from the Tabon Caves of Palawan, dated to around 47,000 BP. Previously, it was believed that the earliest putative record of modern humans in Southeast Asia is from the Callao Cave of northern Luzon in the Philippines dated to around 67,000 BP. However, in 2019, the remains were identified as belonging to a new species of hominid, Homo luzonensis. These people are generally historically referred to as "Australo-Melanesians" or "Australoids", though the terminology is problematic as they are genetically diverse and most groups within Austronesia have significant Austronesian admixture and culture. The unmixed descendants of these groups today include the interior Papuans and Indigenous Australians. Mahdi (2017) also uses the term "Qata" to distinguish the indigenous populations of Southeast Asia, versus "Tau" for the later settlers from Taiwan and mainland China; both are based on proto-forms for the word "person" in Malayo-Polynesian languages that referred to darker-skinned and lighter-skinned groups respectively. Jinam et al. (2017) also proposed the term "First Sundaland People" in place of "Negrito", as a more accurate name for the original population of Southeast Asia. These populations are genetically distinct from later Austronesians, but through fairly extensive population admixture, modern Austronesians all have varying levels of ancestry from these groups. The same is true for some populations historically considered "non-Austronesians" due to physical differences; like Negritos, Orang Asli, and Austronesian-speaking Melanesians, all of whom have Austronesian admixture. In Polynesians in Remote Oceania, for example, the admixture is around 20 to 30% Papuan, and 70 to 80% Austronesian. The Melanesians in Near Oceania are roughly around 20% Austronesian and 80% Papuan, while in the natives of the Lesser Sunda Islands, the admixture is around 50% Austronesian and 50% Papuan. Similarly, in the Philippines, the groups traditionally considered to be "Negrito" vary between 0 to 50% Austronesian. Possible language family homelands and the spread of rice into Southeast Asia (ca. 5,500–2,500 BP). The approximate coastlines during the early Holocene are shown in lighter blue. The broad consensus on the Urheimat (homeland) of Austronesian languages as well as the Neolithic Early Austronesian peoples is accepted to be Taiwan, as well as the Penghu Islands and coastal mainland southern China. The identity of the Neolithic pre-Austronesian cultures in China is contentious. Tracing Austronesian prehistory in mainland China and Taiwan has been difficult due to obliteration of most traces of Austronesian culture by the recent southward expansion of the Han Chinese into southern China since at least the terminal Neolithic (4500 to 4000 BP), the southward expansion of the Han dynasty (2nd century BCE), and the recent Qing dynasty annexation of Taiwan (1683 CE). Today, no Austronesian languages survive in southern China. The politicization of archaeology is also problematic, particularly erroneous reconstructions among some Chinese archaeologists of non-Sinitic sites as Han. Nevertheless based on linguistic, archaeological, and genetic evidence, Austronesians are most strongly associated with the early farming cultures of the Yangtze River basin that domesticated rice from around 13,500 to 8,200 BP. They display typical Austronesian technological hallmarks, including tooth removal, teeth blackening, jade carving, tattooing, stilt houses, advanced boat-building, aquaculture, wetland agriculture, and the domestication of dogs, pigs, and chickens. These include the Kuahuqiao, Hemudu, Majiabang, Songze, Liangzhu, and Dapenkeng cultures which occupied the coastal regions between the Yangtze River delta to the Min River delta. However, he has also raised the possibility that the sound similarities between the Chinese and Austronesian millet terms and basic vocabulary items shown in his past papers may be the result of contact. Sagart's hypothesis has recently been supported by genetic evidence from Ko et al. (2014) and Wei et al. (2017). The Longshan interaction sphere is an alternative explanation for the sound correspondences between Old Chinese and proto-Austronesian. Early waves of migration to Taiwan proposed by Roger Blench. Roger Blench (2014) suggests that the single migration model for the spread of the Neolithic into Taiwan is problematic, pointing out the genetic and linguistic inconsistencies between different Taiwanese Austronesian groups. The surviving Austronesian populations on Taiwan should rather be considered as the result of various Neolithic migration waves from the mainland and back migration from the Philippines. These incoming migrants almost certainly spoke languages related to Austronesian or pre-Austronesian, although their phonology and grammar would have been quite diverse. Based on linguistic evidence, there have been proposals linking Austronesians to Austroasiatic and Sinitic peoples (as Austric and Sino-Austronesian languages, respectively). But evidence of these relationships are tenuous and the methods used are highly contentious. Neither proposals are widely accepted. In particular, similarities between Austronesian and Sinitic languages are believed to be the result of an Austronesian substratum and Neolithic cultural interaction, rather than common descent. 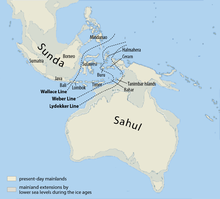 However, it is believed that in western Island Southeast Asia there had been earlier Neolithic overland migrations (pre-4,000 BP) by Austroasiatic-speaking peoples into what is now the Greater Sunda Islands when the sea levels were lower in the early Holocene. These peoples were assimilated linguistically and culturally by incoming Austronesian peoples in what is now modern-day Indonesia and Malaysia. Several authors have also proposed that Kra-Dai speakers may actually be an ancient daughter subgroup of Austronesians that migrated back to the Pearl River delta from Taiwan and/or Luzon shortly after the Austronesian expansion. Later migrating further westwards to Hainan, Mainland Southeast Asia and Northeast India. They proposes that the distinctiveness of Kra-Dai (it is tonal and monosyllabic) was the result of linguistic restructuring due to contact with Hmong-Mien and Sinitic cultures. Aside from linguistic evidence, Roger Blench has also noted cultural similarities between the two groups, like facial tattooing, tooth removal or ablation, teeth blackening, snake (or dragon) cults, and the multiple-tongued jaw harps shared by the Indigenous Taiwanese and Kra-Dai-speakers. However archaeological evidence for this is still sparse. This is believed to be similar to what happened to the Cham people, who were originally Austronesian settlers (likely from Borneo) to southern Vietnam at around 2,100 to 1,900 BP, and had languages similar to Malay. 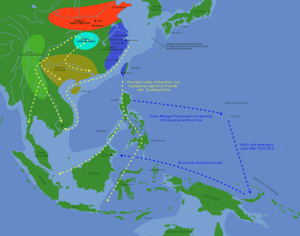 Their languages underwent several restructuring events to syntax and phonology due to contact with the nearby tonal languages of Mainland Southeast Asia and Hainan. An element in the ancestry of Austronesian-speaking peoples, the one which carried their ancestral language, originated on the island of Taiwan. This occurred after the migration of pre-Austronesian-speaking peoples from continental Asia between approximately 10,000–6,000 BCE. Other research has suggested that, according to radiocarbon dates, Austronesians may have migrated from mainland China to Taiwan as late as 4000 BC (Dapenkeng culture). Before migrating to Taiwan, Austronesian speakers originated from the Neolithic cultures of Southeastern China, such as the Hemudu culture or the Liangzhu culture of the Yangtze River Delta. According to the mainstream "out-of-Taiwan model", a large-scale Austronesian expansion began around 3000–1500 BCE. Population growth primarily fuelled this migration. These first settlers may have landed in northern Luzon in the archipelago of the Philippines, intermingling with the earlier Australo-Melanesian population who had inhabited the islands since about 23,000 years earlier. Over the next thousand years, Austronesian peoples migrated southeast to the rest of the Philippines, and into the islands of the Celebes Sea, Borneo, and Indonesia. The Austronesian peoples of Maritime Southeast Asia sailed eastward, and spread to the islands of Melanesia and Micronesia between 1200 BCE and 500 CE, respectively. The Austronesian inhabitants that spread westward through Maritime Southeast Asia had reached some parts of mainland Southeast Asia, and later on Madagascar. 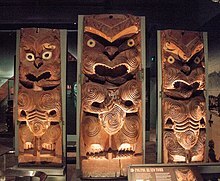 Sailing to Micronesia and the previously uninhabited islands of remote Oceania by 1000 BCE, the Austronesian peoples founded Polynesia. These people settled most of the Pacific Islands. They had settled Rapa Nui (Easter Island) by AD 300, Hawaii by AD 400, and into New Zealand by about 1280 CE. There is evidence, based in the spreading of the sweet potato, that they reached South America where they traded with the Native Americans. In the Indian Ocean they sailed west from Maritime Southeast Asia; the Austronesian peoples reached Madagascar by ca. 50–500 CE. Tianlong Jiao (2007) notes that Neolithic peoples from the coast of southeastern China migrated to Taiwan from 6,500-5,000 B.P. The Neolithic period in southeastern China lasted from 6,500 B.P. until 3,500 B.P., and can be divided into the early (ca, 6500-5000 B.P. ), middle (ca. 5000-4300 B.P. ), and late (ca. 4300-3500 B.P.) Neolithic periods. The Neolithic in southeastern China started off with pottery, polished stone tools, and bone tools, with technology continuing to progress over the years. 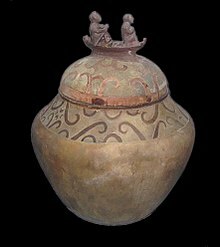 Neolithic peoples in Taiwan and mainland China continued to maintain regular contact with each other until 3,500 B.P., which was when bronze artefacts started to appear. 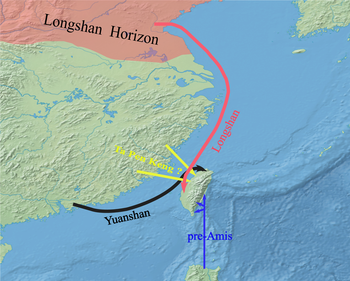 Jiao (2013) notes the Neolithic appeared on the coast of Fujian around 6,000 B.P. During the Neolithic, the coast of Fujian had a low population density, with the population depending on mostly on fishing and hunting, alongside with limited agriculture. A competing hypothesis to the "Out of Taiwan" model is the "Out of Sundaland" hypothesis, favored by a minority of authors. Notable proponents include William Meacham, Stephen Oppenheimer, and Wilhelm Solheim. For various reasons, they proposed that the homelands of Austronesians were within Island Southeast Asia (ISEA), particularly in the Sundaland landmass drowned during the end of the last glacial period by rising sea levels. Stephen Oppenheimer's studies on Southeast Asian and Pacific genetics, in particular, focused on the discovery of a mitochondrial DNA (mtDNA) haplogroup that have been evolving in the Indonesian archipelago for more than 40,000 years ago. He concluded that this meant that ancestral populations in the region of Sundaland were the primary ancestors of all Asians who migrated northwards as the sea levels rose, in opposition to the prevailing "Out of Taiwan" hypothesis. In 2008, a study by Soares et al., which included Oppenheimer, examined mtDNA lineages in ISEA and Taiwan and discovered that, at most, only around 20% of modern mtDNA were introduced during the Neolithic. They examined mtDNA Haplogroup E in particular, which they concluded likely evolved from Haplogroup M (specifically Haplogroup M9), that arrived in ISEA more than 50,000 years ago. Although sea level rise was mostly gradual starting from ~19,000 years ago in the last glacial period, other studies have shown that there were likely three episodes of catastrophic rise events at approximately ~14,500, ~11,500, and ~7,500 years ago caused by ice sheet collapse. They concluded that these sudden sea level floodings triggered mass population displacements from ISEA and were the initial conditions that triggered the development of the maritime technologies that later defined Austronesian culture. In particular they pinpointed the region between the Sulu Sea and the Sulawesi Sea, as the likely point of origin of a pre-adapted maritime culture that expanded north towards Taiwan and east to New Guinea and the Pacific, using the genetic evidence of the dispersal of Haplogroup E as well as putative archeological evidence with the "flake-blade" stone tool assemblages found in the Philippines and Taiwan. However, they also caution that their study only accounts for ~15% of mtDNA lineages in Southeast Asia and that it was not enough pinpoint other directions of dispersal from neighboring groups. 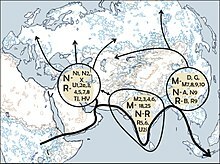 Findings from HUGO (Human Genome Organization) in 2009 further corroborated the studies when it concluded that Asia was populated primarily through a single migration event out of Africa whereby an early population first entered South East Asia before they moved northwards to East Asia. However, in 2014, the results of a study by Lipson et al. contradicted these results. Unlike the earlier studies which focused only on mtDNA, the new study used whole genome data, allowing them to study hundreds of thousands of ancestors, not just one lineage. The team was also using more sophisticated statistical analysis methods that allowed the examination of genetic mixing between Southeast Asian populations. 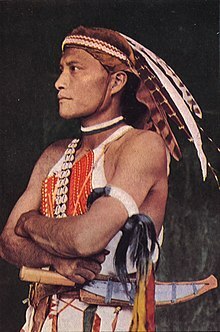 The new study found that all ISEA populations had genes originating from the aboriginal Taiwanese. Contrary to the claim of a south-to-north migration in the "Out of Sundaland" hypothesis, the new whole genome analysis strongly confirms the north-to-south dispersal of the Austronesian peoples in the prevailing "Out of Taiwan" hypothesis. The researchers further pointed out that while humans have been living in Sundaland for at least 40,000 years, the Austronesian people were recent arrivals, and the results of the previous studies failed to take into account admixture between them. In 2016, proponents of "Out of Sundaland" in Brandão et al. refined their earlier hypothesis after examining further mtDNA lineages by acknowledging that migrations from Taiwan did occur during the mid to late Holocene. But they proposed that rather than a monolithic "Austronesian expansion" as posited by the "Out of Taiwan" model, it was instead a process of cultural diffusion and assimilation that brought linguistic and cultural changes (particularly rice cultivation) but had relatively minor genetic impact (an average of 20%) on preexisting populations in ISEA. Their study also still concluded that populations from ISEA did expand northwards earlier during the catastrophic rise events of the Late Pleistocene, dispersing into mainland southern China and then into Taiwan. This was concurrent with other migrations of indigenous maritime-oriented ISEA populations entering Taiwan from the south through the Philippines. Furthermore, they interpret the low genetic contributions of Taiwanese aboriginals to ISEA mtDNA lineags as evidence that Taiwanese aborigines did not contribute significantly to the later southward expansion. Rather the expansion was largely the spread of rice-farming Austronesians from the south China passing through Taiwan at around 7000 to 6000 years ago before entering ISEA again at around ~4.5 thousand years ago. They propose that the admixture of Austronesian genes in Taiwanese populations happened after the Austronesian expansion from southern China, rather than before it. Genomic analysis of cultivated coconut (Cocos nucifera) has shed light on the movements of Austronesian peoples. By examining 10 microsatelite loci, researchers found that there are 2 genetically distinct subpopulations of coconut – one originating in the Indian Ocean, the other in the Pacific Ocean. However, there is evidence of admixture, the transfer of genetic material, between the two populations. Given that coconuts are ideally suited for ocean dispersal, it seems possible that individuals from one population could have floated to the other. However, the locations of the admixture events are limited to Madagascar and coastal east Africa and exclude the Seychelles and Mauritius. Sailing west from Maritime Southeast Asia in the Indian Ocean, the Austronesian peoples reached Madagascar by ca. 50–500 CE, and reached other parts thereafter. This forms a pattern that coincides with the known trade routes of Austronesian sailors. Additionally, there is a genetically distinct sub-population of coconuts on the eastern coast of South America which has undergone a genetic bottleneck resulting from a founder effect; however, its ancestral population is the pacific coconut, which suggests that Austronesian peoples may have sailed as far east as the Americas. 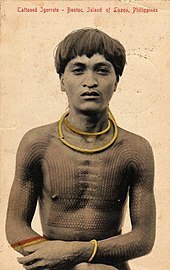 Left: A young Bontoc man from the Philippines (c. 1908) with tattoos on the chest and arms (chaklag). These indicated that the man was a warrior who had taken heads during battle. 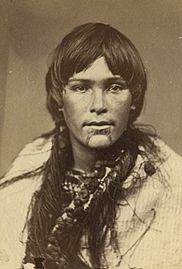 Right: A young Māori woman with traditional tattoos (moko) on the lips and chin (c. 1860–1879). These were symbols of status and rank, as well as being considered marks of beauty. Body art among Austronesian peoples is common, especially elaborate tattooing which has ancient origins. It is particularly prominent in Polynesian cultures, from where the word "tattoo" derives. But tattooing is also prominent among Austronesian groups in Taiwan, the Philippines, Indonesia, and Malaysia. Among the Māori of New Zealand, tattoos (moko) were originally carved into the skin using bone chisels (uhi) rather than through puncturing as in usual practice. In addition to being pigmented, the skin was also left raised into ridges of swirling patterns. In the Philippines, the Spanish called the Filipinos they first encountered in the Visayas as the Pintados, ("the painted ones" or "the tattooed ones") due to their practice of tattooing their entire bodies. Tattooing traditions were mostly lost as the natives of the islands converted to Christianity and Islam, though they were still practised in isolated groups in the highlands of Luzon and Mindanao. Philippine tattoos were usually geometric patterns or stylized depictions of animals, plants, and human figures. Some of the few remaining traditional tattoos in the Philippines are from elders of the Igorot peoples. Most of these were records of war exploits against the Japanese during World War II. Decorated jars and other forms of pottery are also common, with patterns often resembling those used in tattoos. Austronesian peoples living close to mainland Asia were also influenced by Chinese, Indian, and Arabic art forms. Austronesian Vernacular Stilt house is the native cultural houses of Austronesian people. Every Austronesian country has their own name and style for their own Austronesian houses. In the Philippines these are called Bahay kubo with many styles and variants, in Indonesia these are called Rumah adat also with many variants, and in Malaysia these are called Rumah Melayu which are also found in Indonesia and part of the Rumah Adat family. The religious traditions of the Austronesian people focus mostly on ancestral spirits, nature spirits and gods. It is basically a complex animistic religion. Mythologies vary by culture and geographical location but share common basic aspects such as ancestor worship, animism, shamanism and the beliefe in a Spirit world and powerful deities. There is also a great amount of shared mythology and a common believe in Mana. Currently, many of these beliefs have gradually been replaced. 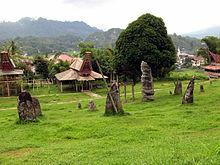 Examples of native religions include: Anito, Sunda Wiwitan, Kejawen, Kaharingan or the Māori religion. Many Austronesian religious believes were incorporated into new arrived religions such as Islam, Christianity and Hinduism. Genetic studies have been done on the people and related groups. The Haplogroup O1 (Y-DNA)a-M119 genetic marker is frequently detected in Native Taiwanese, northern Philippines and Polynesians, as well as some people in Indonesia, Malaysia and non-Austronesian populations in southern China. A 2007 analysis of the DNA recovered from human remains in archeological sites of prehistoric peoples along the Yangtze River in China also shows high frequencies of Haplogroup O1 in the Neolithic Liangzhu culture, linking them to Austronesian and Tai-Kadai peoples. The Liangzhu culture existed in coastal areas around the mouth of the Yangtze. Haplogroup O1 was absent in other archeological sites inland. The authors of the study suggest that this may be evidence of two different human migration routes during the peopling of Eastern Asia; one coastal and the other inland, with little genetic flow between them. ^ Some authors that support an ISEA origin of Austronesians, however, have proposed that they may have later been the original developers of the maritime culture that later characterized Austronesians, during several rapid sea level rise events that took place near the end of the last glacial period that flooded the landmasses in Southeast Asia. Developing the catamaran originally from lashing two canoes, which eventually became the prototype for the numerous types of water vessels of the Austronesians, as well as the Chinese chuán, after northward migrations of Negrito populations in the Neolithic (Mahdi, 2017). ^ "Population, total". Data. World Bank Group. 2017. Retrieved 29 April 2018. ^ "Malaysia". The World Factbook. Central Intelligence Agency. Retrieved 29 April 2018. ^ "Population movement in the Pacific: A perspective on future prospects". Archived from the original on 7 February 2013. Retrieved 2013-07-22. ^ "2015 Census shows population growth moderating". Archived from the original on 7 February 2016. Retrieved 24 July 2016. ^ About 13.6% of Singaporeans are of Malay descent. In addition to these, many Chinese Singaporeans are also of mixed Austronesian descent. See also "Key Indicators of the Resident Population" (PDF). Archived from the original (PDF) on 4 July 2007. Retrieved 2007-04-25. ^ "FIJI TODAY 2005 / 2006" (PDF). Archived from the original (PDF) on 3 April 2007. Retrieved 2007-03-23. ^ "U.S. 2000 Census". Archived from the original on 18 November 2011. Retrieved 23 November 2014. ^ "Suriname". The World Factbook. Central Intelligence Agency. Retrieved 29 April 2018. ^ "A2 : Population by ethnic group according to districts, 2012". Census of Population& Housing, 2011. Department of Census& Statistics, Sri Lanka. ^ a b Meacham, William (1984–1985). "On the improbability of Austronesian origins in South China" (PDF). Asian Perspective. 26: 89–106. ^ Solheim, Wilhem G., II (2000). "Taiwan, Coastal South China and Northern Viet Nam and the Nusantao Maritime Trading Network" (PDF). Journal of East Asian Archaeology. 2 (1–2): 273–284. doi:10.1163/156852300509727. ^ a b c Crowley, Terry; Lynch, John; Ross, Malcolm (2013). The Oceanic Languages. Routledge. ISBN 9781136749841. ^ a b c d e Blust, Robert A. (2013). The Austronesian languages. Asia-Pacific Linguistics. Australian National University. hdl:1885/10191. ISBN 9781922185075. ^ a b Codrington, Robert Henry (1891). The Melanesians: Studies in their Anthropology and Folklore. Oxford: Clarendon Press. ^ a b Ross, Malcolm (June 1996). "On the Origin of the Term 'Malayo-Polynesian'". Oceanic Linguistics. 35 (1): 143–145. doi:10.2307/3623036. JSTOR 3623036. ^ a b Blust, Robert A. (1999). "Subgrouping, circularity and extinction: some issues in Austronesian comparative linguistics". In Zeitoun, Elizabeth; Li, Paul Jen-kuei. Selected Papers from the Eighth International Conference on Austronesian Linguistics. Institute of Linguistics (Preparatory Office), Academia Sinica. pp. 31–94. ^ Ray, Sidney H. (1896). "The common origin of Oceanic languages". The Journal of the Polynesian Society. 5 (1): 58–68. ^ Fox, Charles Elliot (1906). "The Comparison of the Oceanic Languages" (PDF). Transactions and Proceedings of the Royal Society of New Zealand 1868-1961. 39: 464–475. ^ Simpson, John; Weiner, Edmund, eds. (1989). Official Oxford English Dictionary (OED2) (Dictionary). Oxford University Press. p. 22000. ^ a b Baldick, Julian (2013). Ancient Religions of the Austronesian World: From Australasia to Taiwan. I.B.Tauris. ISBN 9780857733573. ^ a b c d e Bellwood, Peter; Fox, James J.; Tryon, Darrell (2006). The Austronesians: Historical and Comparative Perspectives. Australian National University Press. ISBN 9781920942854. ^ a b Blench, Roger (2012). "Almost Everything You Believed about the Austronesians Isn't True" (PDF). In Tjoa-Bonatz, Mai Lin; Reinecke, Andreas; Bonatz, Dominik. Crossing Borders. National University of Singapore Press. pp. 128–148. ISBN 9789971696429. ^ Doran, Edwin B. (1981). Wangka: Austronesian Canoe Origins. Texas A&M University Press. ISBN 9780890961070. ^ Dierking, Gary (2007). 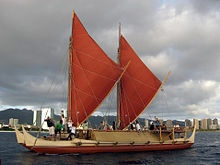 Building Outrigger Sailing Canoes: Modern Construction Methods for Three Fast, Beautiful Boats. International Marine/McGraw-Hill. ISBN 9780071594561. ^ Horridge, Adrian (1986). "The Evolution of Pacific Canoe Rigs". The Journal of Pacific History. 21 (2): 83–89. doi:10.1080/00223348608572530. JSTOR 25168892. ^ a b Abels, Birgit (2011). Austronesian Soundscapes: Performing Arts in Oceania and Southeast Asia. Amsterdam University Press. pp. 16–21. ISBN 9789089640857. ^ a b c d e f g h i j k l m n o p Chambers, Geoffrey K.; Edinur, Hisham A. (2015). "The Austronesian Diaspora: A Synthetic Total Evidence Model". Global Journal of Anthropology Research. 2 (2): 53–65. doi:10.15379/2410-2806.2015.02.02.06. ^ Wibisono, Sonny Chr. (2006). "Stylochronology of Early Pottery in the Islands of Southeast Asia: A Reassessment of Archaeological Evidence of Austronesia". In Simanjuntak, Truman; Pojoh, Ingrid H.E. ; Hisyam, Mohammad. Austronesian Diaspora and the Ethnogeneses of People in Indonesian Archipelago: Proceedings of the International Symposium. Indonesian Institute of Sciences. p. 107. ISBN 9789792624366. ^ Bellwood, Peter (1991). "The Austronesian Dispersal and the Origin of Languages". Scientific American. 265 (1): 88–93. Bibcode:1991SciAm.265a..88B. doi:10.1038/scientificamerican0791-88. JSTOR 24936983. ^ Hill, Adrian V.S. ; Serjeantson, Susan W., eds. (1989). The Colonization of the Pacific: A Genetic Trail. Research Monographs on Human Population Biology No. 7. Oxford University Press. ISBN 9780198576952. ^ a b Simanjuntak, Truman; Pojoh, Ingrid H.E. ; Hisyam, Mohammad, eds. (2006). Austronesian Diaspora and the Ethnogeneses of People in Indonesian Archipelago: Proceedings of the International Symposium. Indonesian Institute of Sciences. p. 107. ISBN 9789792624366. ^ a b c Blench, Roger (2016). "Splitting up Proto-Malayopolynesian: New Models of Dispersal from Taiwan" (PDF). In Prasetyo, Bagyo; Nastiti, Tito Surti; Simanjuntak, Truman. Austronesian Diaspora: A New Perspective. Gadjah Mada University Press. ISBN 9786023862023. ^ Solheim, Wilhelm G., II (1984–1985). "The Nusantao Hypothesis: The Origin and Spread of Austronesian Speakers". Asian Perspectives. 26 (1): 77–78. JSTOR 42928107. ^ a b c Burney, David A.; Burney, Lida Pigott; Godfrey, Laurie R.; Jungers, William L.; Goodman, Steven M.; Wright, Henry T.; Jull, A.J. Timothy (August 2004). "A chronology for late prehistoric Madagascar". Journal of Human Evolution. 47 (1–2): 25–63. doi:10.1016/j.jhevol.2004.05.005. PMID 15288523. ^ Gunn, Bee F.; Baudouin, Luc; Olsen, Kenneth M.; Ingvarsson, Pär K. (22 June 2011). "Independent Origins of Cultivated Coconut (Cocos nucifera L.) in the Old World Tropics". PLoS ONE. 6 (6): e21143. Bibcode:2011PLoSO...621143G. doi:10.1371/journal.pone.0021143. PMC 3120816. PMID 21731660. ^ a b c Dewar, Robert E.; Wright, Henry T. (1993). "The culture history of Madagascar". Journal of World Prehistory. 7 (4): 417–466. doi:10.1007/BF00997802. ^ Blust, Robert (2016). History of the Austronesian Languages. University of Hawaii at Manoa. ^ a b Blench, Roger (2009). "Remapping the Austronesian expansion" (PDF). In Evans, Bethwyn. Discovering History Through Language: Papers in Honour of Malcolm Ross. Pacific Linguistics. ISBN 9780858836051. ^ Bulbeck, David (December 2008). "An Integrated Perspective On The Austronesian Diaspora: The Switch from Cereal Agriculture to Maritime Foraging in the Colonisation of Island Southeast Asia". Australian Archaeology. 67 (1): 31–51. doi:10.1080/03122417.2008.11681877. ^ Cheke, Anthony (2010). "The timing of arrival of humans and their commensal animals on Western Indian Ocean oceanic islands". Phelsuma. 18 (2010): 38–69. ^ Goss, Jon; Lindquist, Bruce (2000). "Placing Movers: An Overview of the Asian-Pacific Migration System" (PDF). The Contemporary Pacific. 12 (2): 385–414. doi:10.1353/cp.2000.0053. ^ Maloney, C. (1980). People of the Maldive Islands. Orient Longman Ltd, Madras. ISBN 978-0-86131-158-3. ^ a b c d e Lipson, Mark; Loh, Po-Ru; Patterson, Nick; Moorjani, Priya; Ko, Ying-Chin; Stoneking, Mark; Berger, Bonnie; Reich, David (2014). "Reconstructing Austronesian population history in Island Southeast Asia" (PDF). Nature Communications. 5 (1): 4689. Bibcode:2014NatCo...5E4689L. doi:10.1038/ncomms5689. PMC 4143916. PMID 25137359. ^ Matsumura, Hirofumi; Shinoda, Ken-ichi; Shimanjuntak, Truman; Oktaviana, Adhi Agus; Noerwidi, Sofwan; Octavianus Sofian, Harry; Prastiningtyas, Dyah; Nguyen, Lan Cuong; Kakuda, Tsuneo; Kanzawa-Kiriyama, Hideaki; Adachi, Noboru; Hung, Hsiao-chun; Fan, Xuechun; Wu, Xiujie; Willis, Anna; Oxenham, Marc F.; Yao, Yong-Gang (22 June 2018). "Cranio-morphometric and aDNA corroboration of the Austronesian dispersal model in ancient Island Southeast Asia: Support from Gua Harimau, Indonesia". PLOS ONE. 13 (6): e0198689. Bibcode:2018PLoSO..1398689M. doi:10.1371/journal.pone.0198689. PMC 6014653. PMID 29933384. ^ a b c d Jett, Stephen C. (2017). Ancient Ocean Crossings: Reconsidering the Case for Contacts with the Pre-Columbian Americas. University of Alabama Press. pp. 168–171. ISBN 9780817319397. ^ a b c d e f Jinam, Timothy A.; Phipps, Maude E.; Aghakhanian, Farhang; Majumder, Partha P.; Datar, Francisco; Stoneking, Mark; Sawai, Hiromi; Nishida, Nao; Tokunaga, Katsushi; Kawamura, Shoji; Omoto, Keiichi; Saitou, Naruya (August 2017). "Discerning the Origins of the Negritos, First Sundaland People: Deep Divergence and Archaic Admixture". Genome Biology and Evolution. 9 (8): 2013–2022. doi:10.1093/gbe/evx118. PMC 5597900. PMID 28854687. ^ a b c Mahdi, Waruno (2017). "Pre-Austronesian Origins of Seafaring in Insular Southeast Asia". In Acri, Andrea; Blench, Roger; Landmann, Alexandra. Spirits and Ships: Cultural Transfers in Early Monsoon Asia. ISEAS - Yusof Ishak Institute. pp. 325–440. ISBN 9789814762755. ^ Jennings, Ralph (17 November 2008). ""Negritos" celebrated as early Taiwan settlers". Reuters. Retrieved 6 January 2019. ^ "New evidence of Negrito presence unearthed in Taiwan". Taiwan Today. 26 October 2010. Retrieved 6 January 2019. ^ Matsumara, Hirofumi; Hung, Hsiao-chun; Cuong, Nguyen Lan; Zhao, Ya-feng; He, Gang; Chi, Zhang (2017). "Mid-Holocene Hunter-Gatherers 'Gaomiao' in Hunan, China: The First of the Two-layer Model in the Population History of East/Southeast Asia". In Piper, Philip J.; Matsumura, Hirofumi; Bulbeck, David. New Perspectives in Southeast Asian and Pacific Prehistory. ANU Press. pp. 61–78. doi:10.22459/TA45.03.2017.04. ISBN 9781760460945. ^ Détroit, Florent; Dizon, Eusebio; Falguères, Christophe; Hameau, Sébastien; Ronquillo, Wilfredo; Sémah, François (2004). "Upper Pleistocene Homo sapiens from the Tabon cave (Palawan, The Philippines): description and dating of new discoveries" (PDF). Human Palaeontology and Prehistory. 3 (2004): 705–712. doi:10.1016/j.crpv.2004.06.004. ^ Détroit, Florent; Corny, Julien; Dizon, Eusebio Z.; Mijares, Armand S. (2013). ""Small Size" in the Philippine Human Fossil Record: Is It Meaningful for a Better Understanding of the Evolutionary History of the Negritos?" (PDF). Human Biology. 85 (1): 45–66. doi:10.3378/027.085.0303. PMID 24297220. ^ Détroit, F.; Mijares, A.S.; Corny, J.; Daver, G.; Zanolli, C.; Dizon, E; Robles, E.; Grün, R.; Piper, P.J. (2019). "A new species of Homo from the Late Pleistocene of the Philippines". Nature. 568 (7751): 181–186. doi:10.1038/s41586-019-1067-9. PMID 30971845. ^ Reich, David; Patterson, Nick; Kircher, Martin; Delfin, Frederick; Nandineni, Madhusudan R.; Pugach, Irina; Ko, Albert Min-Shan; Ko, Ying-Chin; Jinam, Timothy A.; Phipps, Maude E.; Saitou, Naruya; Wollstein, Andreas; Kayser, Manfred; Pääbo, Svante; Stoneking, Mark (October 2011). "Denisova Admixture and the First Modern Human Dispersals into Southeast Asia and Oceania". The American Journal of Human Genetics. 89 (4): 516–528. doi:10.1016/j.ajhg.2011.09.005. PMC 3188841. PMID 21944045. ^ Cooper, A.; Stringer, C. B. (17 October 2013). "Did the Denisovans Cross Wallace's Line?". Science. 342 (6156): 321–323. Bibcode:2013Sci...342..321C. doi:10.1126/science.1244869. PMID 24136958. ^ a b Bellwood, Peter (9 December 2011). "The Checkered Prehistory of Rice Movement Southwards as a Domesticated Cereal—from the Yangzi to the Equator" (PDF). Rice. 4 (3–4): 93–103. doi:10.1007/s12284-011-9068-9. ^ Fox, James J. (2004). Current Developments in Comparative Austronesian Studies. Research School of Pacific and Asian Studes, Australian National University. ^ a b Melton, Terry; Clifford, Stephanie; Martinson, Jeremy; Batzer, Mark; Stoneking, Mark (December 1998). "Genetic Evidence for the Proto-Austronesian Homeland in Asia: mtDNA and Nuclear DNA Variation in Taiwanese Aboriginal Tribes". The American Journal of Human Genetics. 63 (6): 1807–1823. doi:10.1086/302131. PMC 1377653. PMID 9837834. ^ Mirabal, Sheyla; Cadenas, Alicia M.; Garcia-Bertrand, Ralph; Herrera, Rene J. (April 2013). "Ascertaining the role of Taiwan as a source for the Austronesian expansion" (PDF). American Journal of Physical Anthropology. 150 (4): 551–564. doi:10.1002/ajpa.22226. PMID 23440864. ^ Zhang, Chi; Hung, Hsiao-Chun (2008). "The Neolithic of Southern China - Origin, Development, and Dispersal" (PDF). Asian Perspectives. 47 (2). ^ Liu, Li; Chen, Xingcan (2012). The Archaeology of China: From the Late Paleolithic to the Early Bronze Age. Cambridge University Press. ISBN 9780521643108. ^ Major, John S.; Cook, Constance A. (2016). Ancient China: A History. Taylor & Francis. ISBN 9781317503668. ^ a b Blench, Roger (2008). "Stratification in the peopling of China: How far does the linguistic evidence match genetics and archaeology?" (PDF). In Sanchez-Mazas, Alicia; Blench, Roger; Ross, Malcolm D.; Peiros, Ilia; Lin, Marie. Past Human Migrations in East Asia: Matching Archaeology, Linguistics and Genetics. Routledge Studies in the Early History of Asia. Routledge. pp. 105–132. ISBN 9781134149629. ^ a b Blench, Roger (2009). The Prehistory of the Daic (Tai-Kadai) Speaking Peoples and the Austronesian Connection (PDF). Presented at the 12th EURASEAA meeting Leiden, 1-5th September, 2008. European Association of Southeast Asian Archaeologists. ^ a b c Sagart et al. 2017, p. 188. ^ Sagart et al. 2017, p. 205. ^ Sagart et al. 2017, p. 206. ^ Ko 2014, pp. 426–436. ^ Wei et al. 2017, pp. 1-12. ^ a b c Blench 2014, pp. 1-17. ^ a b Simanjuntak, Truman (2017). "The Western Route Migration: A Second Probable Neolithic Diffusion to Indonesia". In Piper, Hirofumi Matsumura and David Bulbeck, Philip J.; Matsumura, Hirofumi; Bulbeck, David. New Perspectives in Southeast Asian and Pacific Prehistory. terra australis. 45. ANU Press. ISBN 9781760460952. ^ a b Ross, Malcolm D. (2008). "The integrity of the Austronesian language family: From Taiwan to Oceania". In Sanchez-Mazas, Alicia; Blench, Roger; Ross, Malcolm D.; Peiros, Ilia; Lin, Marie. Past Human Migrations in East Asia: Matching Archaeology, Linguistics and Genetics. Routledge Studies in the Early History of Asia. Routledge. pp. 161–181. ISBN 9781134149629. ^ Vovin, Alexander (1997). "The comparative method and ventures beyond Sino-Tibetan". Journal of Chinese Linguistics. 25 (2): 308–336. ^ van Driem, George (1998). "Neolithic correlates of ancient Tibeto-Burman migrations". In Blench, Roger; Spriggs, Matthew. Archaeology and Language II: Archaeological Data and Linguistic Hypotheses. One World Archaeology. 29. Routledge. pp. 67–102. ISBN 9780415117616. ^ a b Blench, Roger (2018). Tai-Kadai and Austronesian are Related at Multiple Levels and their Archaeological Interpretation (draft). ^ a b Blench, Roger (2017). "Ethnographic and archaeological correlates for a mainland Southeast Asia linguistic area" (PDF). In Acri, Andrea; Blench, Roger; Landmann, Alexandra. Spirits and Ships: Cultural Transfers in Early Monsoon Asia. ISEAS - Yusof Ishak Institute. pp. 207–238. ISBN 9789814762755. ^ Zumbroich, Thomas J. (2007–2008). "The origin and diffusion of betel chewing: a synthesis of evidence from South Asia, Southeast Asia and beyond". eJournal of Indian Medicine. 1: 87–140. ^ a b Gray, RD; Drummond, AJ; Greenhill, SJ (2009). "Language Phylogenies Reveal Expansion Pulses and Pauses in Pacific Settlement". Science. 323 (5913): 479–483. Bibcode:2009Sci...323..479G. doi:10.1126/science.1166858. PMID 19164742. ^ Kun, Ho Chuan (2006). "On the Origins of Taiwan Austronesians". In K. R. Howe. Vaka Moana: Voyages of the Ancestors (3rd ed.). Honolulu: University of Hawai'i Press. pp. 92–93. ISBN 978-0-8248-3213-1. ^ Bellwood, Peter (2014). The Global Prehistory of Human Migration. p. 213. ^ Goodenough, Ward Hunt (1996). Prehistoric Settlement of the Pacific, Volume 86, Part 5. American Philosophical Society. pp. 127–128. ^ Li, H; Huang, Y; Mustavich, LF; et al. (November 2007). "Y chromosomes of prehistoric people along the Yangtze River". Hum. Genet. 122 (3–4): 383–8. doi:10.1007/s00439-007-0407-2. PMID 17657509. ^ Pawley, A. (2002). "The Austronesian dispersal: languages, technologies and people". In Bellwood, Peter S.; Renfrew, Colin. Examining the farming/language dispersal hypothesis. McDonald Institute for Archaeological Research, University of Cambridge. pp. 251–273. ISBN 978-1902937205. ^ Gibbons, Ann. "'Game-changing' study suggests first Polynesians voyaged all the way from East Asia". Science. Retrieved 23 March 2019. ^ Jiao, Tianlong. 2007. The Neolithic of Southeast China: Cultural Transformation and Regional Interaction on the Coast. Cambria Press. ^ Jiao, Tianlong. 2013. "The Neolithic Archaeology of Southeast China." In Underhill, Anne P., et al. A Companion to Chinese Archaeology, 599-611. Wiley-Blackwell. ^ Solheim, Wilhelm G., II (2006). Archaeology and culture in Southeast Asia : Unraveling the Nusantao. University of the Philippines Press. ISBN 978-9715425087. ^ a b Oppenheimer, Stephen (1998). Eden in the east: the drowned continent. London: Weidenfeld & Nicolson. ISBN 978-0-297-81816-8. ^ a b Rochmyaningsih, Dyna (28 October 2014). "'Out of Sundaland' Assumption Disproved". Jakarta Globe. Retrieved 24 December 2018. ^ a b Soares P, Trejaut JA, Loo JH (June 2008). "Climate change and postglacial human dispersals in southeast Asia". Mol. Biol. Evol. 25 (6): 1209–18. doi:10.1093/molbev/msn068. PMID 18359946. "New DNA evidence overturns population migration theory in Island Southeast Asia". Phys.org. 23 May 2008. ^ "Genetic 'map' of Asia's diversity". BBC News. 11 December 2009. ^ Kumar, Vikrant (11 December 2009). "Scientific consortium maps the range of genetic diversity in Asia, and traces the genetic origins of Asian populations". HUGO Matters. Human Genome Organisation. Archived from the original on 4 January 2014. ^ HUGO Pan-Asian SNP Consortium; Abdulla MA; Ahmed I; Assawamakin A; et al. (December 2009). "Mapping human genetic diversity in Asia". Science. 326 (5959): 1541–5. Bibcode:2009Sci...326.1541.. doi:10.1126/science.1177074. PMID 20007900. ^ Lipson, Mark; Loh, Po-Ru; Patterson, Nick; Moorjani, Priya; Ko, Ying-Chin; Stoneking, Mark; Berger, Bonnie; Reich, David (19 August 2014). "Reconstructing Austronesian population history in Island Southeast Asia". Nature Communications. 5 (1): 4689. Bibcode:2014NatCo...5E4689L. doi:10.1038/ncomms5689. PMC 4143916. PMID 25137359. ^ a b Pedro A. Soares; Jean A. Trejaut; Teresa Rito; et al. (2016). "Resolving the ancestry of Austronesian-speaking populations". Human Genetics. 135 (3): 309–326. doi:10.1007/s00439-015-1620-z. PMC 4757630. PMID 26781090. ^ Gunn, Bee; Luc Baudouin; Kenneth M. Olsen (2011). "Independent Origins of Cultivated Coconut (Cocos nucifera L.) in the Old World Tropics". PLoS ONE. 6 (6): e21143. Bibcode:2011PLoSO...621143G. doi:10.1371/journal.pone.0021143. PMC 3120816. PMID 21731660. ^ Krutak, Lars (2005–2006). "Return of the Headhunters: The Philippine Tattoo Revival". The Vanishing Tattoo. Retrieved December 9, 2013. ^ Kirch, Patrick V. (1998). "Lapita and Its Aftermath: the Austronesian Settlement of Oceania". In Goodenough, Ward H. Prehistoric Settlement of the Pacific, Volume 86, Part 5. American Philosophical Society. p. 70. ISBN 978-0-87169-865-0. ^ Bellwood, Peter (2007). Prehistory of the Indo-Malaysian Archipelago. ANU E Press. p. 151. ISBN 9781921313127. ^ Best, Eldson (1904). "The Uhi-Maori, or Native Tattooing Instruments". The Journal of the Polynesian Society. 13 (3): 166–172. ^ Major-General Robley (1896). 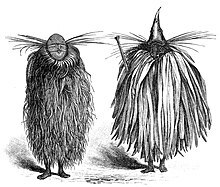 "Moko and Mokamokai — Chapter I — How Moko First Became Knows to Europeans". Moko; or Maori Tattooing. Chapman and Hall Limited. p. 5. Retrieved 2009-09-26. ^ Cummins, Joseph (2006). History's Great Untold Stories: Obscure Events of Lasting Importance. Pier 9. p. 133. ISBN 9781740458085. ^ Lach, Donald F. & Van Kley, Edwin J. (1998). Asia in the Making of Europe, Volume III: A Century of Advance. Book 3: Southeast Asia. University of Chicago Press. p. 1499. ISBN 9780226467689. ^ Masferré, Eduardo (1999). A Tribute to the Philippine Cordillera. Asiatype, Inc. p. 64. ISBN 9789719171201. ^ Salvador-Amores, Analyn Ikin V. (2002). "Batek: Traditional Tattoos and Identities in Contemporary Kalinga, North Luzon Philippines". Humanities Diliman. 3 (1): 105–142. ^ Van Dinter; Maarten Hesselt (2005). The World Of Tattoo: An Illustrated History. Centraal Boekhuis. p. 64. ISBN 9789068321920. ^ Krutak, Lars (2009). "The Kalinga Batok (Tattoo) Festival". The Vanishing Tattoo. Retrieved December 9, 2013. ^ Watts, Joseph; Sheehan, Oliver; Greenhill, Simon J.; Gomes-Ng, Stephanie; Atkinson, Quentin D.; Bulbulia, Joseph; Gray, Russell D. (2015-09-23). "Pulotu: Database of Austronesian Supernatural Beliefs and Practices". PLoS ONE. 10 (9): e0136783. Bibcode:2015PLoSO..1036783W. doi:10.1371/journal.pone.0136783. ISSN 1932-6203. PMC 4580586. PMID 26398231. ^ Bloomsbury.com. "Ancient Religions of the Austronesian World". Bloomsbury Publishing. Retrieved 2019-04-18. ^ Handoko, Wuri. "THE CONTINUITY OF AUSTRONESIAN TRADITION ON ISLAMIC AND EARLY COLONIAL PERIOD IN MALUKU 1". ^ Li, Hui; Huang, Ying; Mustavich, Laura F.; Zhang, Fan; Tan, Jing-Ze; Wang, ling-E; Qian, Ji; Gao, Meng-He & Jin, Li (2007). "Y chromosomes of prehistoric people along the Yangtze River" (PDF). Human Genetics. 122 (3–4): 383–388. doi:10.1007/s00439-007-0407-2. PMID 17657509. Archived from the original (PDF) on 14 December 2013. Bellwood, Peter S. (1979). Man's conquest of the Pacific: The prehistory of Southeast Asia and Oceania. Oxford University Press. ISBN 9780195201031. Bellwood, Peter (2007). Prehistory of the Indo-Malaysian Archipelago (3rd, revised ed.). ANU E Press. ISBN 978-1-921313-12-7. Bellwood, Peter; Fox, James J.; Tryon, Darrell, eds. (2006). The Austronesians : historical and comparative perspectives. Australian National University. ISBN 978-1920942854. Diamond, Jared M. (1998). Guns, Germs, and Steel. Vintage. ISBN 978-84-8306-667-6. Benitez-Johannot, Purissima, ed. (2009). Paths of Origins. ArtPostAsia Books. ISBN 978-9719429203. Archived from the original on 16 October 2011. Retrieved 14 October 2011. James J. Fox (2006). Origins, Ancestry and Alliance: Explorations in Austronesian Ethnography. ANU E Press. ISBN 978-1-920942-87-8. Cristian Capelli; et al. (2001). "A Predominantly Indigenous Paternal Heritage for the Austronesian-Speaking Peoples of Insular Southeast Asia and Oceania" (PDF). American Journal of Human Genetics. 68 (2): 432–443. doi:10.1086/318205. PMC 1235276. PMID 11170891. Archived from the original (PDF) on 14 February 2010. This article incorporates text from a publication now in the public domain: Chisholm, Hugh, ed. (1911). "Mundās" . Encyclopædia Britannica. 19 (11th ed.). Cambridge University Press.